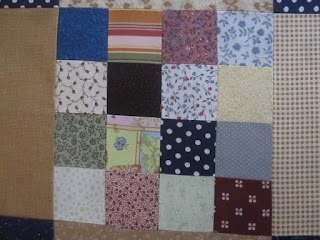 Scrap quilts are great because you can use any and all fabrics in them. When the ugly fabric is cut up into little pieces, you won't even notice it. If you use your lights and darks effectively, no one will even see what kinds of fabrics there are. Not from a distance at least. Here are just a few of the blocks in the Auntie Alice quilt. Darks don't always have to be blacks, navys and grays - they can be dark reds too. That lower left square is actually printed fabric. I did not piece that - although, I could have if I didn't have enough darks. 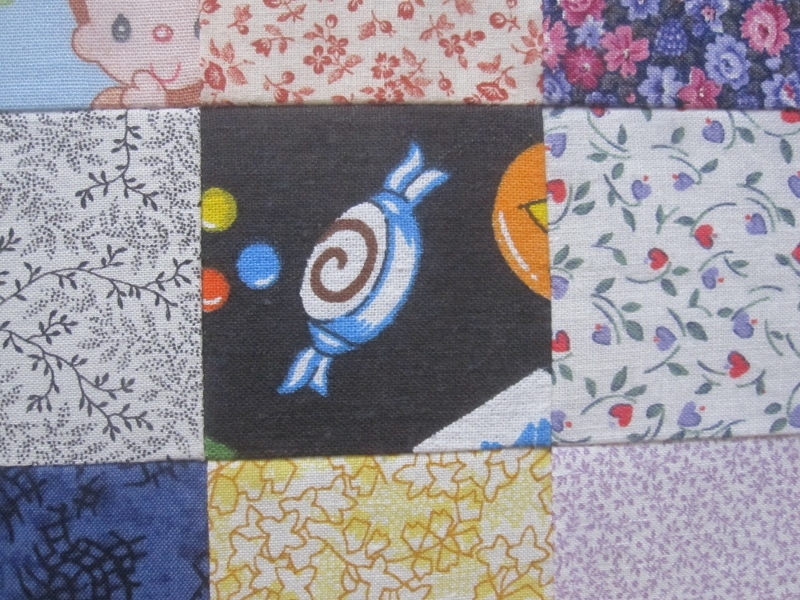 I have some fabric that has candies on it. Why on earth I bought it, I'll never know. It works here because the overall feel of the little piece is dark. After trimming the backing of a quilt, one is quite often left with little strips of fabric - like this one. 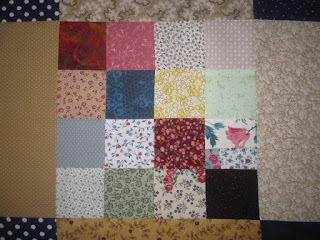 I will use anything that comes to hand when I'm piecing - especially if it really doesn't matter. All that really matters is the value of the overall piece. In this instance, it's light. Even stripes can be used. Anything goes. Just have fun. Scrappy. That's the way I like it. My favourite kind of quilt. It took me some time to learn to see the value of my fabrics, and sometimes the same fabric would go for medium and light, depending on the other fabrics of each quilt. 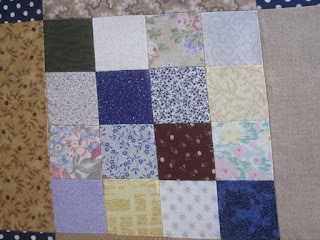 These patchwork blocks are one of my favorite quilt blocks. They make a cozy quilt. It's funny about using small bits of ugly fabric; you are so right. You're my kind of scrap quilter! I take whatever is next. I make a lot of small items by just grabbing whatever scraps are closest! 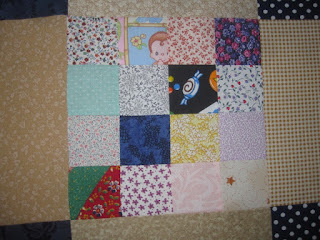 That's why I love scrap quilts too!!!! 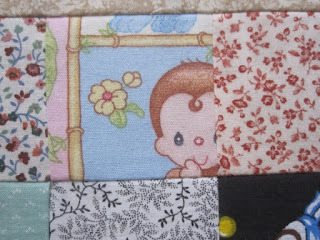 Love the wee monkey peeking at us! 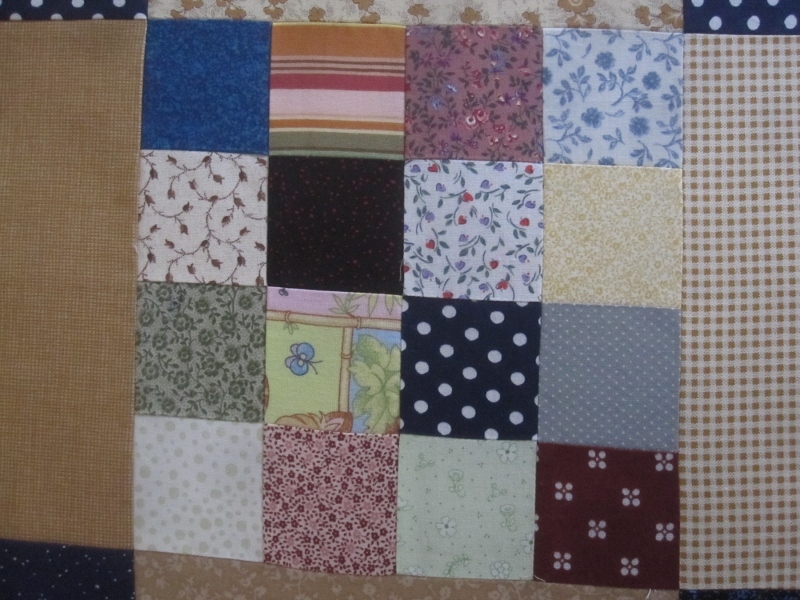 Things like that make a quilt fun - it's the joy of discovering something unexpected.